Plot synopsis: An elderly woman tries to persuade a pair of disbelieving children that she, too, was once young. Based on a short story first published in Collier's magazine, on 25 November 1950; and later as a chapter in Ray Bradbury's Dandelion Wine, in 1957. Plot synopsis: A District Attorney prosecutes a murder trial in which the key witness has suffered a stroke and is unable to speak. Review: This episode is billed as an experiment since it features just a single performer, Raymond Burr - the story has other characters, but Burr's is the only voice that is heard. In all honesty, though, and despite Burr's abilities as an actor, I'm not sure what value there is in not having other actors in the cast (unless it was simply to save money ...) The story is not about a solitary individual - it centres on a criminal trial, after all - so giving the other characters their own voices would have been perfectly fine, if not in fact preferable. However, leaving the episode's 'gimmick' aside, the main problem with it is that the story itself is extremely weak and terribly clichéd. Frankly, I lost interest in the murder plot around halfway through, and the episode isn't even very long. The ending in particular is very poor: I won't reveal the surprise 'twist', but it is a tired, familiar one that has been used by countless thrillers both before and since. Plot synopsis: A part-dramatized documentary about the White House and some of its most famous occupants. Review: Broadcast a week before the 1956 presidential election (spoiler: Eisenhower won), this episode offers a historical tour of the White House from when its construction began in 1792, right up until the 1950s. More than just an examination of the building itself, the episode is also a study of the presidency, offering brief discussions of many of the White House's most notable residents, including in some cases dramatizations of key moments of their lives. In many ways, then, this is an interesting and informative episode, with plenty of enlightening facts and anecdotes. However, there are also problems. First, some of the information presented is more myth than fact. For example, the episode repeats the oft-cited, but erroneous, claim that the reason the Executive Mansion is called the White House is because it was painted white to cover up the burn marks left when the British set it ablaze in 1814; yet in truth, the building had been referred to as the White House years prior to this date. Second, some listeners (particularly, though I wouldn't say exclusively, non-American ones) may find the degree of patriotic reverence hard to stomach. Okay, no one who listens to Old Time Radio is going to expect this to be a searing critique of US politics and society, but even so, the lack of any sort of critical perspective is disappointing. Could such an anodyne approach be taken with more recent presidents (say, Lyndon Johnson, Richard Nixon, George W. Bush or Barack Obama) given how divisive and controversial many modern ones have been? Perhaps, though it would probably be much harder to sustain this sort of outlook today. At any rate, listen to the episode by all means, but treat the contents with caution. Plot synopsis: In a future dominated and controlled by advertising agencies, an executive in one of these firms is assigned the campaign to persuade people to move to Venus, despite its extremely harsh, hostile environment. Based on a novel of the same name first published in 1953 (adapted from a serial published in Galaxy Science Fiction magazine, as 'Gravy Planet', in 1952). Plot synopsis: The classic story of Cinderella told in two ways: the traditional version and an updated modern one. 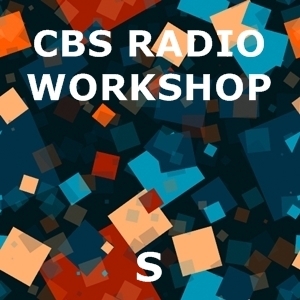 Review: A clever, funny episode, this is also one of the few CBS Radio Workshop productions to feature big-name stars - Vincent Price and Lurene Tuttle - which undoubtedly adds to its entertainment value. Still, the main draw is the story itself, which illustrates the perhaps surprising facts that there is nothing new about presenting a 'revisionist' take on fairy tales and that people did question the passivity, and downright sappiness, of traditional fairy-tale heroines long before the contemporary vogue for modern (or even postmodern) retellings. This episode was, after all, made in the 1950s, when many peoples' perceptions of such stories and characters were heavily shaped by the Disney adaptations, in which the female leads were far from the strong, 'feisty' characters of their more recent output. At any rate, this episode is a refreshing antidote to traditional fairy-tale tellings - indeed, it offers a useful contrast to both Disney's 1950 cartoon and its 2015 live-action versions of the Cinderella story. While Tuttle gives us the conventional 'romantic' take on the story, Price presents a more 'realistic' one (which, given the period, means lots of 'hip' slang along the lines of 'the joint was jumping' etc., which raises a smile itself). As Price asks of the traditional story, how is just one dance the basis for a solid, lasting relationship? And in terms of Cinderella's submissive meekness, he pointedly remarks: why doesn't she stand up for herself? In his version, she does just this, being a much more assertive, proactive lead, who makes things happen for herself instead of just waiting to be rescued by a dashing prince. There are lots of inventive touches along the way as well, reworking the famous fairy tale's details into more modern variants - for example, a safe that Cinderella breaks into to 'borrow' some jewellery for the party she intends to gatecrash has a time lock that activates at midnight, which is why she must leave by this time; the car she drives is pumpkin-orange etc. I would recommend playing this to any children who know only the Disney films! Plot synopsis: An adaptation of the Blackfoot Indian legend recounting how the Morning Star once came down to Earth and took a human wife. Review: Sometimes, one comes across the (highly patronizing) view that appears to assume that simply because a story originates among indigenous peoples, it must automatically be regarded as poetic and compelling and full of timeless wisdom. In some cases, of course, this may be true, but just like any other form of fiction, native storytelling covers the spectrum from great to terrible. This is a long preamble to my judgment that the story featured in this episode, based on Native-American legends, is, frankly, decidedly so-so. Perhaps it would come across differently in its original form, but at least as a radio drama, I found the tale of only minimal interest. Moreover, despite the generally sensitive handling of the material, it's obvious that the cast is composed entirely of white Americans, so it's not even as if the episode offers a showcase for Native-American performers. Plot synopsis: A violent storm, called Maria, hits the west coast of America. Based on a novel first published in 1941.